Can Phnom Penh’s Olympic Stadium withstand the force of globalization? Fifty years after being served as the grand venue for the second Ganefo, the Olympic Stadium of Phnom Penh is still being fully utilized by the population. Unlike the other large stadiums around the world where people are not allowed to freely access, the Olympic stadium is one among the few remaining public spaces in Phnom Penh which provides the urban residents with convivial encounters. As an important site of the city, the stadium holds historical, symbolic and functional importance. Like other cities across the region, spaces in Phnom Penh have been privatized and taken by different corporations. Historical buildings and some other spaces are being covered by large private constructions, and are at risk of privatization. Unfortunately, the stadium is also being threatened by the privatization of its surrounding area. Thus, this paper looked into how negative trends of globalization, particularly privatization of space, which has taken place throughout Asia, affects the future of the stadium. As one among the rare cases of inclusiveness of public and civic space, the study shed lights on how the Olympic Stadium of Phnom Penh is different from the other cases by highlighting its usage and significances throughout different stages of Cambodia’s modern history. While the stadium is one of the very few civic and public spaces of the city, it is important to find solutions to preserve the space for social and economic benefits. Globalization has intensified the competition among cities throughout the globe. Cities compete for attentions, influence, markets, investments, businesses, talents and tourists. To take part in the global competition, city branding has been used as a tool to publicize their competitive advantages. One among the branding strategies that a number of mega cities have been using is through mega sport events. The largest and most recognized mega-sporting event is the Olympics. To be able to host and accommodate such grand mega-sporting event, city has to ensure that grand infrastructures are built. In the case of Beijing’s 2008 Olympic Games, million-dollar landmark buildings were constructed to accommodate the grand event. The iconic National Stadium and the National Aquatics Center were being used to showcase Beijing’s productive capacities and modernization achievements. As Sertac and Sena put it, stadiums are built with extravagance in order to attract interest of masses, to create new image about the space that they are built in, and to launch urban regeneration in their surrounding environment. However, after the events, post-event usage of the stadiums has become a complicated question that urban planners have to answer as well as a challenge that they have to deal with. Thus, the use of stadiums has been questioned in terms of sustainability and its effectiveness. 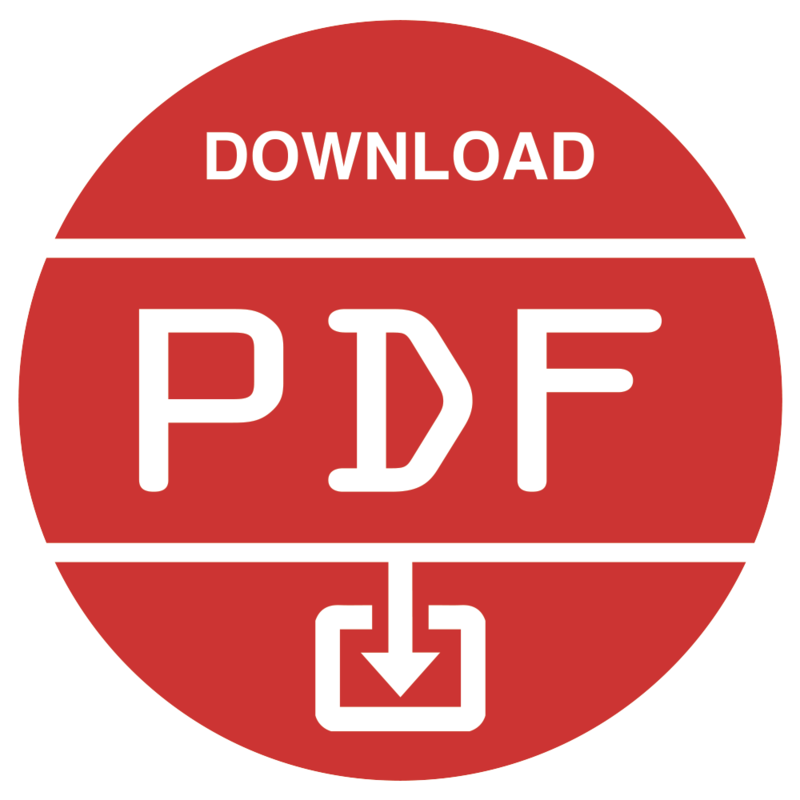 This study aims at exploring the factors which drive Phnom Penh’s Olympic Stadium to become an inclusive space which is opposite from the other stadiums around the world. Next, the study will look into how negative trend of globalization, particularly privatization of space, which has taken place throughout Asia, affects the future of the stadium. As one among the rare cases of inclusiveness of public and civic space, the study will shed lights on how the case of Olympic Stadium of Phnom Penh is different from the other cases. While Phnom Penh’s Olympic Stadium is one of the very few civic and public spaces of the city, it is important to find solutions to prevent the space from being demolished and how the space can be preserved. Though mega sport events have been used as tools to market the city to the world, such events have always been questioned in terms of efficiency in the use of resources. As mentioned by Romain and Sylvain, after the Olympics, a considerably low percentage of stadiums are being utilized. As a consequence, these utilities had become “white elephants” costing triple of what was originally planned. Below examples illustrate the usage of stadiums throughout the world after mega sport events had taken place. The examples will serve as reflections of the differences between the functions of other sport complexes and those of Phnom Penh’s Olympic Stadium. Along with the other stadiums, Stade de France was constructed to host the 1998 World Cups. The French World Cup stadium has the capacity of 80, 000 seats. During the World Cup, the stadium was used as the venue for the opening and the final games. After the World Cup, the stadium has been used for football and rugby while it can also be adapted to host Olympic standard events. On the one hand, the stadium has become outdated in terms of catching up with the surrounding areas. It has been enclosed by motorways and a canal, and has been isolated from the surroundings. As the host of 2014 World Cup, the soccer powerhouse constructed 12 stadiums with the cost of $3 billion. The number of stadiums constructed clearly shows the oversupply of stadiums as FIFA only requires the host nations to build 8 stadiums. A year after the World Cup, the stadiums have been neglected or used for other purposes. In addition, the country’s sports minister had acknowledged that investing in the 2014 World Cup stadiums was a failure. For instance, the Arena Amazonia in the jungle city of Manaus which cost $300 million for the construction has fallen into despair due to its long distance from the populated areas. The most expensive of all the World Cup Stadiums, the Estadio Nacional in Basilia, which cost $550 million to construct, is now being used as a bus parking lot after hosting seven World Cup games while The Arena Pernambuco in Recife is now being used to host corporate events, fairs, conferences and wedding ceremonies. Constructed as a part of the 2000 Olympic Games, ANZ Stadium has been considered as one among the white elephants due to the insufficient usage after the Olympic Games. Though the stadium was constructed with the capacity of 80,000 seats, after the event, it has never been able to attract enough events of sufficient scale to fill its full seating capacity. Even if the stadium has been utilized during the Rugby games, the sheer size of the stadium gave a very negative atmosphere to the games as the stadium is sparsely populated. Similar to the case of Brazil, this stadium was constructed against the advice of the International Olympic Committee. In addition, the immense capacity has become its disadvantage as it cannot compete with the smaller centrally located indoors venues, especially the aquatics center which better responds to the need of the Australian citizens. Considered to be the worst example of venue legacy planning. Ten years after the games, nearly 20 stadiums built to host the Summer Games in Athens have been abandoned or rarely used. Most of the stadiums have been fenced and covered with graffiti while such construction has been considered to be a waste of billions of dollars. The economic recession after the game had led to public anger among the citizens over the government’s inability to make efficient use of resource. In this regard, the stadiums and the Olympic games have become the symbols of the government’s waste of resources. Beijing’s Bird’s Nest stadium was constructed to accommodate the 2008 Summer Games. The construction cost $480 million while the other $11 million has to be spent each year for the maintenance of the stadium. Similar to the other Olympic stadiums, which have been mentioned above, Beijing’s Bird’s Nest has the seating capacity of 80,000. Despite its high maintenance costs, the stadium has become the tourist attraction, yet there is a lack of regular tenant. The Water Cube of the city’s National Aquatics Center has now been transformed into a public water park where hundreds of kids are using for their swimming lessons. The Chinese effort to open the stadiums to the public shortly after the Olympic Games ended, has attracted the citizens to utilize the space. Phnom Penh’s Olympic Stadium was constructed in 1964, by the well-known Cambodian architect, Vann Molyvann. As one among the most important landmarks of Phnom Penh, the stadium has been utilized in different ways based on different periods and political eras that Cambodia had undergone. With the capacity to hold 70,000 people, 50,000 seated and 20,000 standing, the stadium was constructed to host the 1964 Southeast Asian Games, yet the ongoing conflict in Vietnam in addition to the unsettling conditions in the country prevented the Southeast Asia Games from taking place in Phnom Penh. During its prime, the stadium was the largest in Southeast Asia. In 1966, the Olympic Stadium housed the Asian Ganefo when 15 Asian countries participated in the game. In September 1 of the same year, the stadium was used for Charles de Gualle’s speech when he called for an end to the Vietnam War. As the Vietnam War spilled into Cambodia’s territory, America’s bombing on Cambodia in the early 1970s had turned the stadium into an informal refugee camp to house migrants from the countryside. As Jeffery put it, the Olympic Stadium was not only constructed to be used as a mere public space or to host sport events, the stadium was meant to be constructed to serve as the symbol of the rebirth of a modern nation which was once home to the powerful and thriving Khmer Empire. Thus, it can be implied that the stadium along with the other massive construction projects throughout the country signified huge steps that the king was taking in his process of building a new nation which has just recently gained independence from its former colonial master. Vann Molyvann and the king were both trying to construct an identity for a modern Cambodia to raise the country’s image in the international stage. According to Daniel, the designs of these buildings reflect nation building as well as ongoing tensions between the French heritage, and the desire to create a new national identity with the post-colonial context. Thus, after the construction, the National Sports Complex would serve as the important symbol of Cambodian nationalism through the representation of the Khmer Style Architecture which was introduced to the international community through sports and other formal ceremonies in the 1960s. One among the features of the integration of ancient Khmer architectural knowledge is the modern translation of Angkor’s hydraulic concept through the use of a system of moats with drainage function which has already been filled up. In April 1975, when the Khmer Rouge soldiers were taking over the city, the Olympic Stadium became the site for helicopter evacuations where foreign embassies evacuated their nationals to escape the Khmer Rouge. After the Khmer Rouge took over the whole city, the stadium was converted into the execution ground where Lon Nol military personnel and government officials were executed. Unlike the other landmarks, which have been shot down by the Khmer Rouge for being the sign of capitalism, the Olympic Stadium was among the sites which survived the Khmer Rouge regime. As mentioned by Roberts and Kanaley, urban areas were left to die and be destroyed by nature and neglect as the Khmer Rouge considered cities to be the symbol of capitalism. On the one hand, as argued by Professor James Tyner through personal response, though the Khmer Rouge were anti-capitalist and anti-imperialist, in practice, the Khmer Rouge’s leadership was a form of state capitalism which was very similar to that of the former Soviet Union. Thus, the Communist Party of Kampuchea (CPK), not the workers, controlled all the surplus values. Cities were not completely abandoned as they were used to facilitate rice export to China and elsewhere. As he further mentioned, the CPK still required cities to continue to function, yet cities were operated in a smaller scale in order to accomplish production and distribution of rice and other commodities. For this reason, the CPK did not set out to destroy all the symbols of capitalism. In addition, the CPK exhibited a practice of ‘continuity and conversion’ whereby some institutions and locations continued their pre-revolutionary functions while some others were converted. For instance, the garment district in Phnom Penh which produced textiles prior to 1975, still produced textiles between 1975 and 1970, and it still continues to produce textiles today. As he added, concluding that the National Bank was destroyed as a symbol of capitalism is still a question. Conversely, it could have been that the National Bank was simply collateral damage in the fighting. On the other hand, the Stadium served an important practical function for the CPK while the CPK did not explicitly set out to destroy all places associated with capitalism. As personally responded by professor David Chandler, a leading scholar on the history of Cambodia, the only buildings, which were destroyed by the Khmer Rouge, were catholic churches and the National Bank while the Khmer Rouge also melted down the statue of a French General. As he further mentioned, the Khmer Rouge did not systematically destroy evidence of imperialism as the French Embassy and any other embassies were left untouched. The National Archives which stored expensive records of colonial rule, was also left undamaged. To him, the Olympic Stadium was the only venue in Phnom Penh for large gathering, and the Khmer Rouge needed the space for occasional rallies and other purposes. Apart from being served as the execution ground, the Khmer Rouge used the stadium for military exercise before moving out of the city. Between 1979 and 1980s, after the collapse of the genocidal regime, the stadium was being underutilized as the city was being slowly repopulated. Cities in Pacific Asia have become more tightly integrated into global economy. Such integration has led to the transformation of built environment to support economic growth. Similar to some other countries in Asia Pacific region, Phnom Penh has been affected by both negative and positive trends of globalization. Public spaces such as parks and monuments have been privatized to serve the neoliberal purposes. As city is rapidly developing, the supply of public spaces continues to decline while the government is not able to respond to the need of the population. While some of the spaces have already been privatized, the remaining spaces are being covered by privatized spaces, and are also at risk of being transformed into the privatized landscape. As mentioned by Douglass and Ho, major aspects of the city that were once considered to be public like streets, sidewalks, parks and other spaces which provide collective experience, suddenly became private spaces which are immersed to the dynamics of commodification. Spaces which once used to be parks, old buildings, have now been turned to condos, apartments and shopping malls. These privatized spaces carry with them neoliberal traits where free access is being restricted to some extents. As a city which is being developed without a clear plan or zoning, Phnom Penh’s landscape is being threatened by the increase in mega projects, edge-city projects and gated communities. Similar trend of development has also been found in Phu My Hung, Ho Chi Minh City, where colossal edge-city project has been taking place. To suit the newly developed landscape, indigenous spaces have been replaced by shopping, recreation and global facilities to house foreign franchises. Like other urban spaces in the region, the Olympic stadium is also sharing the same destiny. In 2000, a Taiwanese development firm redeveloped the stadium to get the right to develop the parcels of land surrounding the stadium. This was the time when big privatization project started taking place around the Olympic Stadium. As written by Asia Foundation in 2015, the complex was sold to a private developer in 2001. The company then started parsing out pieces of land surrounding the stadium for the construction of retail and office buildings. Currently, the areas around the stadium have been undergoing the construction of a luxurious twin-condo of 35 floors and 256 units. The construction is situated right in the southeast part of the stadium. This 100-million-dollar condo is expected to finish by the end of 2017. IV. Why Phnom Penh’s Olympic Stadium Is Different from the Others? To understand how the populations are utilizing the stadium, a short survey of 18 questions was distributed to get information on how the stadium is used, the citizens’ perceptions regarding the importance of the stadium and the development that is taking place around the stadium, the cost of entrance fee and whether the fee deters them from going to the stadium, and if the government should preserve the stadium. 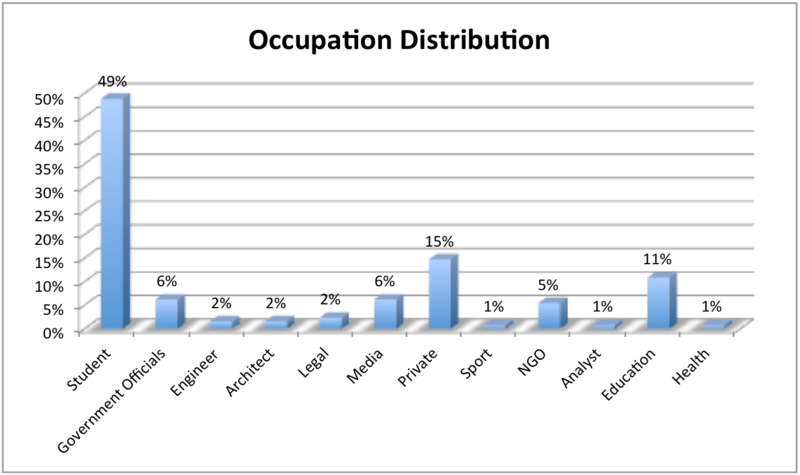 In total, 129 respondents from 12 different occupations participated in the survey. As shown in figure 1, 49 percent of the respondents who expressed their concerns are students, 15 percent comes from private sector, 11 percent comes from education sector, 6 percent from media sector, 5 percent from NGO and the other 6 percent of the respondents are public officials while the rest comes from 7 other sectors. 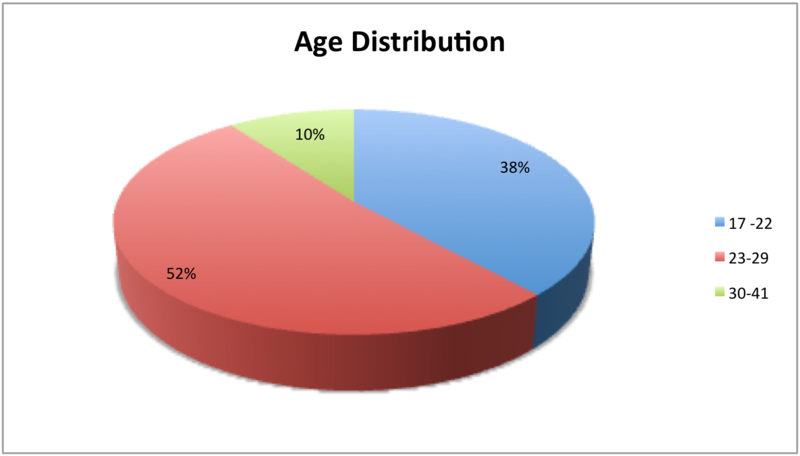 As shown in figure 2, 52 percent of the total respondents are between 23 and 29 years old, 38 percent of the respondent are between 17 and 22 years of age and another 10 percent are those between 30 and 41 years old. Though elder populations above 40 are also utilizing the stadium, the fact that the surveys were distributed online is the reason why people of elder ages could not be reached for the responses. IV.1. What Can We Do at the Stadium? Unlike the other stadiums around the world which have been aforementioned, the Olympic Stadium of Phnom Penh is being utilized by ordinary citizens in various ways. 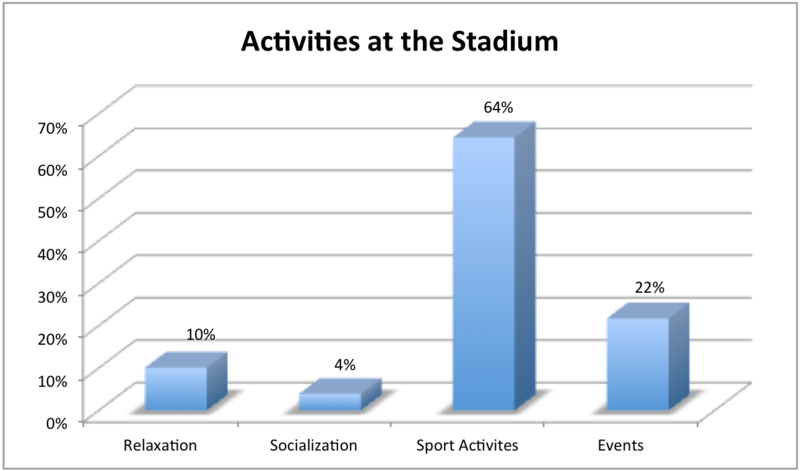 As shown in figure 4, how the stadium is being utilized by the ordinary population has been categorized into 4 main spectrums. As reported by 10 percent of the total respondents, the stadium provides a very good environment for relaxation where people sit and relax after their whole day of working while some others just walk around the stadium with their families or watch other people playing soccer or the other types of sports. Thus, we can see that the various activities and convivial environment inside the stadium have made the stadium a relaxing space for sightseeing and family outing. In addition, another 4 percent of the total respondents have reported that the stadium is a space which provides a good environment for socialization and meeting new people since stadium is opened for the public everyday. Though the stadium is not well maintained, the space is still being heavily used as a sport complex. 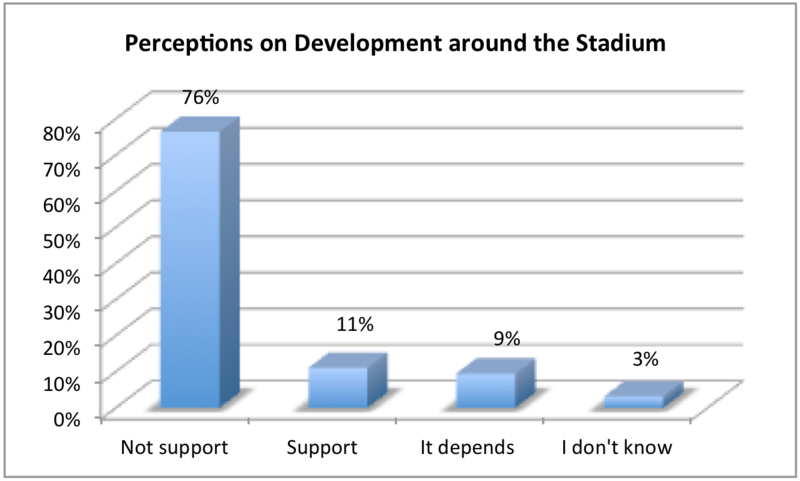 As reported, 64 percent of the respondents have used the stadium for sport activities. The large open space on the very top of the stadium serves its function as the dancing floor for group aerobics and a space to overlook the scenery of the surrounding areas. Within the complex, there are spaces for jogging, soccer, swimming, tennis, badminton, basketball, training martial arts and other types of sports. On the other hand, the other 22 percent of the respondents occasionally go to the stadium for big events. In particular, those who go to the stadium once a year usually go for concerts, events, fairs and sport tournaments while those who frequently go to the stadium have often utilized sport facilities as well as used the stadium as a place for relaxation and socialization. Until today, the stadium is a place to host national and international soccer matches, other sports’ competitions, fairs, concerts and even political gathering. Though entrance fee might have been thought to be a barrier that prevents the citizens from using the stadium, 49.6 percent of the respondents have reported that they do not have to pay to enter the stadium while the other 50.4 percent reported that they paid some amount. Although some visitors have to pay, the fee is usually for parking their vehicles which costs between 1000 to 2000 Riels (25 to 50 cents in USD). For the event tickets, the highest amount reported was 5 USD. Entering the open space and some sport facilities which do not require maintenance like outdoor basketball court is free of charge, yet for some sport facilities which requires maintenance, utilization fees are minimally charged. For instance, the entrance fee for swimming pool is 2000 Riels per person (around 50 US cents). As further reported, 86.3 percent expressed that the fee does not prevent them from going to the stadium while the other 13.7 percent reported that the fee does prevent them from going to the stadium. From this finding, one of the important factors which leads to the high utilization rate of the stadium is the low entrance fee. While the other stadiums are only utilized as sporting facilities, Phnom Penh’s Olympic Stadium holds an important symbolic and physical importance among the Cambodian population. 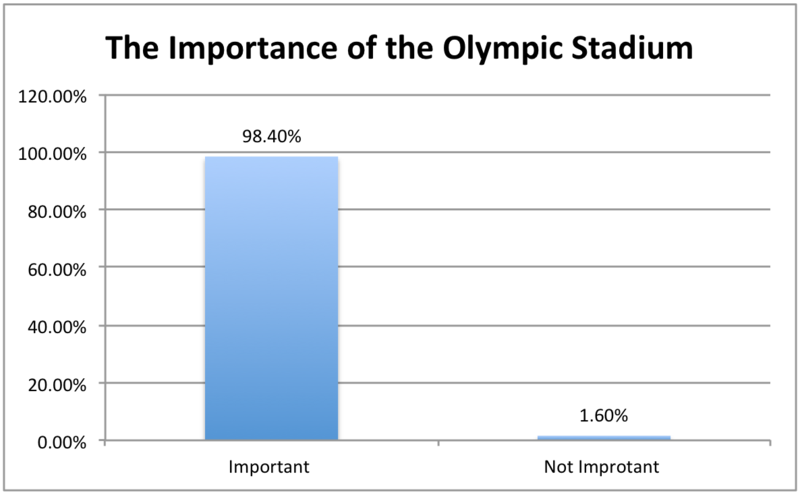 Based on the survey data, 98.4 percent has reported that the Olympic Stadium is an important landmark for the city while the other 1.6 percent or 2 out of 129 respondents think that the stadium is not an important element of the city. Despite being a mere sport stadium which only hosts sport events, the Olympic Stadium still performs its main function as envisioned by its builders. 52 years after it was constructed, the Olympic Stadium is considered by the population as the iconic monument and the masterpiece of Cambodia’s well-known architect, Vann Molyvann. While other stadiums seem to look alike, the Olympic Stadium is the product of a unique post-modern Khmer design which carries an important symbol of the once thriving nation in Southeast Asia before it was ruined by a series of wars. As raised by 10 of the respondents, the Olympic Stadium is the symbol of the glorious past of Sangkum Reastr Niyum, a period which many Cambodians consider to be the Golden Age of Cambodia after the Khmer Empire. Apart from the glorious legacy, some of the respondents consider the stadium to be one among the monuments which reminds them of the past histories that Phnom Penh and the whole country were going through. As the number of public spaces in Phnom Penh is shrinking, besides Phnom Penh’s riverside, the stadium is one among the very few public spaces that Phnom Penh residents can get access to. Moreover, the strategic location of the stadium which is right in the center of the whole city, has made the stadium a convenient location where people from every corner of the city can get access to without having to commute from a very far distance. As a remaining large open space inside a rapidly developing city, the respondents have reported that Phnom Penh’s Olympic Stadium offers them with a relaxing environment where they can get fresh air despite having to inhale exhaust fume. In addition, such large space is also a space where people get to escape the hectic urban life which is also the factor that makes the stadium an attraction for foreign tourists who come to the city. 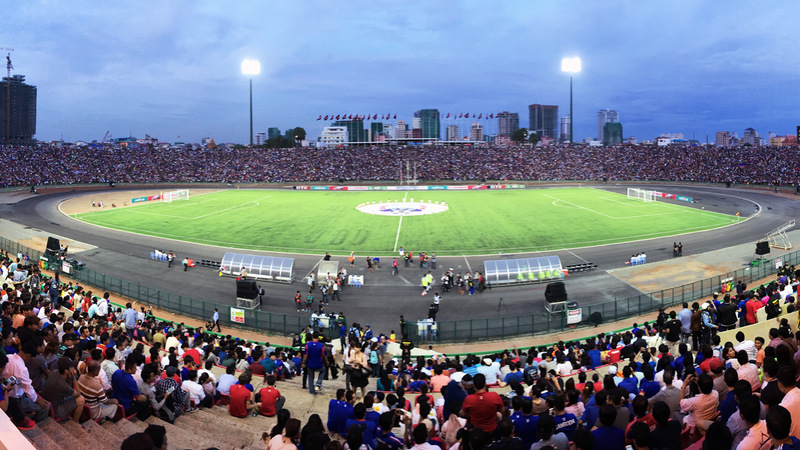 As mentioned by a few respondents, the uniqueness in design has earned the stadium the title as a symbol of Phnom Penh as well as the representation of the surrounding area which has been named after the stadium. While the citizens have acknowledged the importance of the stadium, they were further asked whether they think the government should preserve the Olympic Stadium. 96.9 percent of the respondents agreed that the government should preserve the stadium while 2.3 percent of the respondents reported that they are not sure whether the stadium should be preserved. Surprisingly, only one among 129 respondents objected the idea of preserving the stadium. As the respondents further expressed their opinions on why the stadium should be preserved, one among the respondents raised that the Olympic Stadium should serve as an example of the past development that the future leaders should look at, and think of how they should further develop the city. As mentioned by another respondent, the Olympic Stadium is the symbol of the nation’s pride that should be preserved as a national heritage. While none of Cambodian architect is at a comparable level to Vann Molyvann, the stadium should be preserved as an example of the creativity level that a Cambodian architect could achieve. What is more, some of the respondents have also raised that the stadium is the symbol of national identity and country’s unification which is exactly how the stadium was meant to be built for. Interestingly, one among the respondents was questioning whether the new stadiums would be able to replace the Olympic Stadium. Below is the excerpt of the comments made by one of the respondents. Well! Such a great question! You can place 100 other stadiums. But, when is it? And what is it for? Does it give an amazing urban livelihood like the Olympic Stadium? That’s just a kind of business. The excerpt expresses the attachment that the citizens have toward the stadium. While leaders tend to think that new stadium or high-rise apartments are what the citizens really want, the livelihood might be more desirable than having modern buildings. As another respondent argued, the development is not the reason to destroy the past while Europe should be the model to look up to in the case of preserving the old heritage. It’s one of the masterpiece left from the famous architect since the last decades. Development isn’t a reason for destroying the past to build modern building. In the developed countries in Europe, hardly you see high-rise, but mostly are building with less story, and they can be preserved well. I want to keep this place for a historical reflection rather than high rise building. If they want to build skyscraper, why not thinking of going to other place rather than damaging or blocking the city view? Create other sub-town, make a new business center for new city and connect the old city. While acknowledging the symbolic importance of the stadium, the respondents have also expressed their growing concerns toward the issue of shrinking public space in Phnom Penh. Besides thinking about having a growing economy, places for relaxing and recreation also contribute to a better urban livelihood. We don’t have many public places anymore. They sell many places. The city is very stressful, and it will become more stressful in the next few years. We do need places to relax, public green park, picnic space and space for sport……..
As Kiruri and Teller put it, “white elephants” are usually the results of the planning approach which only the building authority and the architects were included in the design process while no future users were consulted. One among the obstacles to active integration of stadiums into the built environments is the fact that stadiums are being constructed for some specific types of events only. Historically, ancient stadiums in Athens were originally constructed to be more like a cultural space rather being a functional one. In modern time, most stadiums constructed for the Olympic Games were usually located with a designated area to accommodate all facilities required by the event. These facilities include sport avenues, Olympic village, press center, broadcast center and other venues to serve the guests. These campus-like structures are usually isolated from the center of the city. In contrast, as being aforementioned, the Olympic Stadium of Phnom Penh follows a similar pattern to those of the ancient time. Instead of being solely built to host sport events, the Olympic Stadium of Phnom Penh represents the combination of the ancient Khmer culture and the modern architectural style which allows the stadium to serve its dual functions as sport facility and cultural monument. To be able to serve the dual-purposes, the stadium was constructed right in the center of the city which is very different from the other mega structures around the world. V. The Surrounding Privatization, Did We Make a Right Decision? The development and privatization of the vicinity around the stadium has taken place since 2000 after Taiwan’s Yuan Ta Construction and Engineering Co was able to secure the deal to develop the land surrounding the stadium. Later on, this development was denounced by the former Phnom Penh Municipal Governor, Chea Sophara. He referred to the development as a big scandal, and called it illegal and technically unfeasible. As he was further cited in The Phnom Penh Post’s article in 2001, the Municipal office also raised concerns regarding the effects of the development of the surrounding area, yet the concerns were ignored during the discussion in the Council of Ministers. Though he refused that he had not seen the plan of the development, it was found that the plan was submitted to him, and he already approved before it was further approved by the Ministry of Urbanization and Construction. As The Post further mentioned, the plan was criticized by experts for ignoring sewage lagoons around the perimeter of the stadium site which were built to prevent the area from being flooded. As shown in Figure 6, around 76 percent of the total respondents objected the development surrounding the stadium while 11 percent supported the development since they believe that the development will bring about positive change to the stadium as well as economic growth. On the other hand, 9 percent of the total respondents expressed mixed views toward the development as they think that the development is not necessarily bad, yet the government should also avoid negative effects of the development on the stadium. As a majority of the respondents have raised their concerns, the development around the stadium has been criticized for its unorganized pattern of development by constructing high-rise buildings in a very crowded part of the city. In addition, the respondents are concerning about the large influx of traffic that the development project will bring into the area which has already been congested. As further reported, such development will affect the environment around the stadium since some of the important parts of the stadiums have been demolished to meet the development purposes. Additionally, most respondents have raised their objections toward the development surrounding the stadium as they believe that the development would block the whole stadium, which has served as a space to overlook the view of the city and to get fresh air while doing exercise. As suggested by a few of the respondents, since Phnom Penh is lack of green space, the government should think of integrating green space into the stadium instead of blocking the area with concrete jungle. In particular, two respondents have also voiced out their concerns toward the exclusion from getting access to the stadium if the private developer further develops the stadium while some other respondents are also worried that the stadium would be demolished in the future. VI. What Would Happen to the Stadium in the Future? What Can We Do about It? Like other cities in the region, privatization of public space is not a completely new issue. Cities around Asia have privatized public spaces to serve economic purposes. Similar trend can be found in Bangkok where public spaces have been replaced by the developments of large-scale housing and shopping mall. Likewise, many other cities are currently experiencing the trend of withering of public spaces due to market liberalism. As Douglass and Daniere mentioned, globalization has pushed an agenda of privatization of public space. Additionally, the abrupt transition from developmentalism to neoliberalism has led to massive privatization of urban space, and has brought about mega-project across urban core and peri-urban areas. As reported by a Cambodian urban planner, though the Master Plan of Phnom Penh has just been endorsed, the zoning plan of the city has not been in place yet. Thus, it is very difficult to reject any development. Since there is no document or development plan of the Olympic Stadium made available to the public, projecting the future development of the Olympic Stadium is a challenge. However, based on the preliminary outlook of the development of the “Olympia City” (the development project of Taiwanese firm, Yuan Ta Group, on the parcels of the Olympic Stadium complex), the Olympic Stadium might be integrated into the mega project. As reported in the Phnom Penh Post in 2012, after various social groups raised their concerns toward the future of the stadium, the developer responded that they would not cause any damage to the stadium. As the stadium has already been sold to the developer in 2001, it is more likely that the Olympic stadium will become a privately owned public space. As defined by Kayden, the overall access and use of the space is under the control of the owners. For this reason, in the near future, public access to the Olympic Stadium might be under the control of the developer like the other privately owned public spaces. However, as the Cambodian government has taken a very pivotal role in urban development, the government can consider taking a role as a negotiator to discuss with the developers on how the stadium will be opened to the public. Since preserving the stadium is more desirable for the public, putting the stadium as a heritage site of the city can be a way to protect the stadium as a public space for the citizens. Yet, listing the stadium as a heritage site requires strong political will from the government, and not all the old stadiums have been listed as heritage. Amongst the 24 stadiums in other parts of the world, which had been constructed since 1896, five of the stadiums have been demolished while seven others have already been transformed, and only two are listed as heritages. The two stadiums which have been listed as heritages are the Olympic Stadium of Amsterdam (1928) and the Los Angeles Stadium (1984). Therefore, there is a high possibility that the Olympic Stadium of Phnom Penh will also be transformed like the other seven old stadiums. Phnom Penh’s Olympic Stadium has always been a very important public space for the urban population. Besides solely functioning as a sport complex like the other stadiums around the world, the Olympic Stadium is considered by the population as the symbol of their culture, their identity and the nation’s pride. The location, the attachment and its multi-purpose usage, have made the historical stadium an exceptional and pivotal space that the population believes should be preserved. To suit the neoliberal purposes, the complex and its surrounding area have been privatized. As the development plan of Phnom Penh is unclear, the future of the stadium is still uncertain. Based on current development outlook of the Olympia City and the other examples throughout the world, it is more likely that the stadium will be integrated into the development as a privately owned public space. For this reason, the use of the stadium might be decided by the developers, yet the government will be a very important player who can negotiate with the developers on whether to preserve or to transform the stadium.